General Hospital (GH) spoilers for the week of December 18-22 tease that the action will heat up in Port Charles. For starters, Sonny (Maurice Benard) and Jason (Steve Burton) will discuss the memory mayhem. They’ll mull over a few possibilities as they consider how to learn the traitor’s identity. Jason will still believe Drew (Billy Miller) is their best shot at discovering the truth. Later, Jason and Drew will come together for a mutual goal. It sounds like Jason will fill Drew in on what he learned from Andre (Anthony Montgomery). Drew has been incredibly frustrated by his lack of memories lately. Will the thought of getting them back excite Drew or leave him fearful? Perhaps it’ll be a little of both. Regardless, Drew will definitely want to find out who’s responsible for all this. 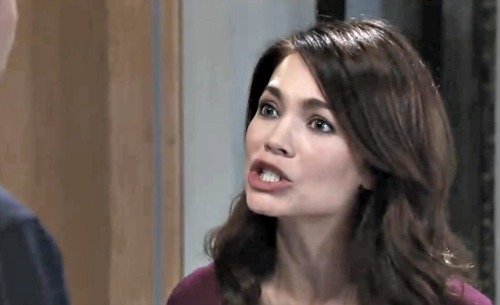 Other General Hospital spoilers say Alexis (Nancy Lee Grahn) will infuriate Molly (Haley Pullos). Perhaps Alexis will once again show signs of longing for Julian (William deVry). She might start avoiding Dr. Bensch (James DePaiva) as well. None of that would please Molly. It’s clear that she thinks the doc’s a far better choice than Julian. Molly will blast Alexis and make her point of view known this week. Meanwhile, Maxie (Kristen Storms) will have a lot on her mind. She’ll likely be concerned about her pregnancy and all the issues that come with having another baby. Felicia (Kristen Wagner) will do her best to reassure Maxie. She’ll promise that everything’s going to work out just fine, but something tells us it won’t! There’s bound to be some GH baby drama sooner or later. Speaking of baby drama, Michael’s (Chad Duell) fears will grow stronger. He won’t want Nelle (Chloe Lanier) to keep his child away from him, so he’ll do whatever he can to make sure that doesn’t happen. It looks like that’ll involve making a heartfelt speech and caving a bit on Nelle’s demands. Across town, things will get crazy as Laura (Genie Francis) and Kevin (Jon Lindstrom) prepare for their nuptials. A massive storm will put the whole ceremony in jeopardy. They’ll also face a serious setback when the minister has a personal emergency. Fortunately, Kevin and Laura will refuse to let the obstacles destroy their happiness. They’ll push through the chaos and enjoy a lovely wedding. Elsewhere, a strange note will catch Franco (Roger Howarth) off guard. After a heated confrontation with Liz (Rebecca Herbst), Franco will eventually receive and ponder this mysterious message. Is this some sort of threat? General Hospital spoilers hint that trouble could be brewing for Franco and the people he cares about. We’ll give you updates as other GH news comes in. Stay tuned to the ABC soap and don’t forget to check CDL often for the latest General Hospital spoilers, updates and news.